"Postkassa deres ser dum ut." Duolingo should post pictures when coming up with sentences like this one! 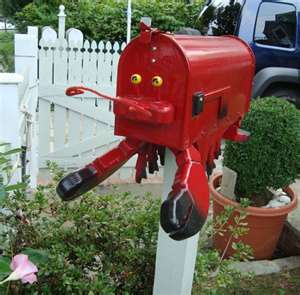 How does a stupid mailbox look like?! Well, you can't say he couldn't defend his point. I'm confused by the last two words--does it mean it looks dumb (outside) or is 'ut' part of dum? You'll see this structure with all kinds of adjectives that can describe either the appearance -or- some other quality of a person or thing, used to clarify what is meant. "Han ser dum ut, men han er den smarteste personen jeg kjenner." "He looks stupid, but he's the smartest person I know."